When I had very few stamps, I started a binder for the images, so that I had a place to refer to when looking for a stamp to use. 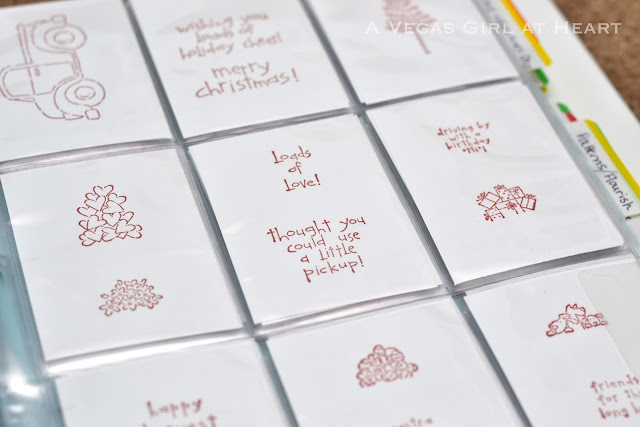 I tried to keep up with stamping new ones as they came in, but eventually, when my collection grew exponentially, I could no longer take the time to stamp them. 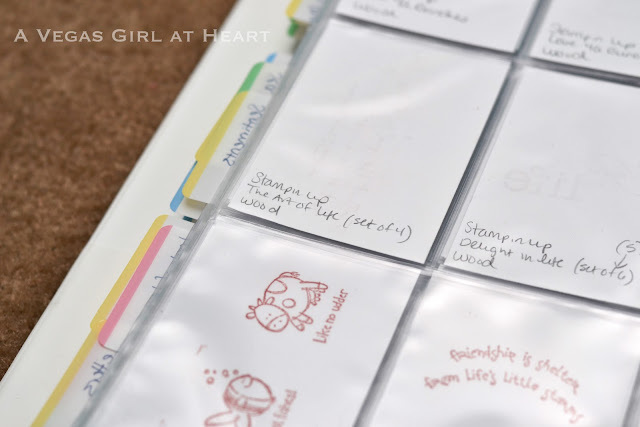 I photocopied them (in singles or in sets) and inserted them into the binder as best I could, but I ended up having a lot of stamps in the wrong categories. A big culprit is the Stampin' Up sets, which often cover several themes. 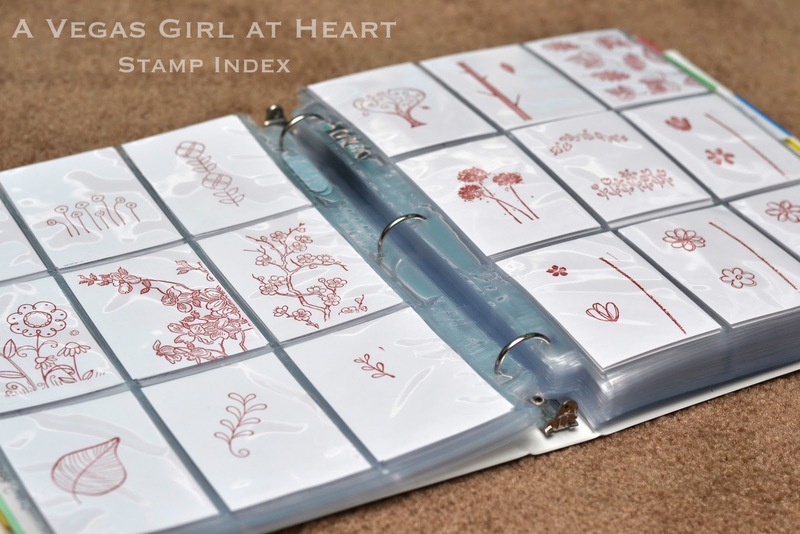 So I set out to create a new stamp index for my rubber stamps. 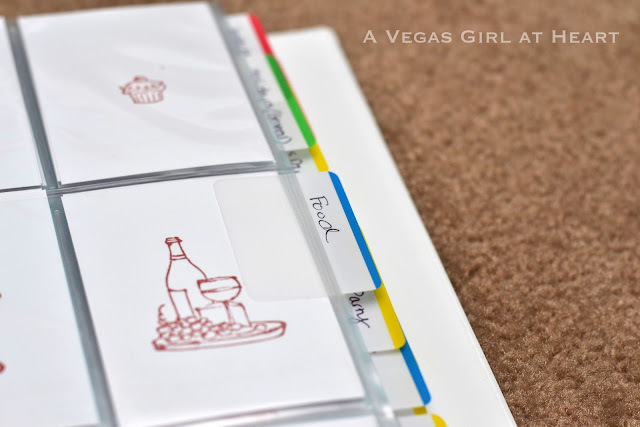 (My clear ones are organized by category in clear bags, so having them in this binder isn't necessary at this time). I used a three ring binder, and baseball card page protectors. I picked up two packs of 30 at KMart, and they're a really good quality. I then cut white cover stock into 2.5"x3.5" sized cards, and began stamping my images on them. Most stamps fit one to a card, but I do have many smaller stamps, and those I put two (sometimes three) to a card, especially if they coordinated. 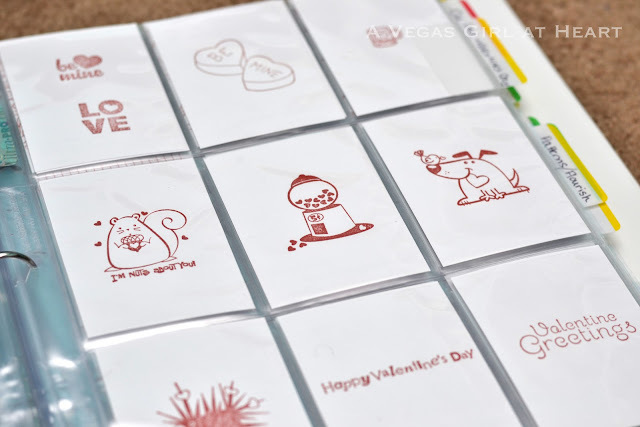 I got some new $1 stamps at Michaels this week for Valentine's Day, a few of which are shown below. This took me 3 nights (about 9 hours) to complete the 500+ stamps. I wanted to get it done so I could make some cards this weekend, otherwise, I would have gone at a slower pace and done maybe an hour a night. This came out AWESOME. Such a fantastic idea! 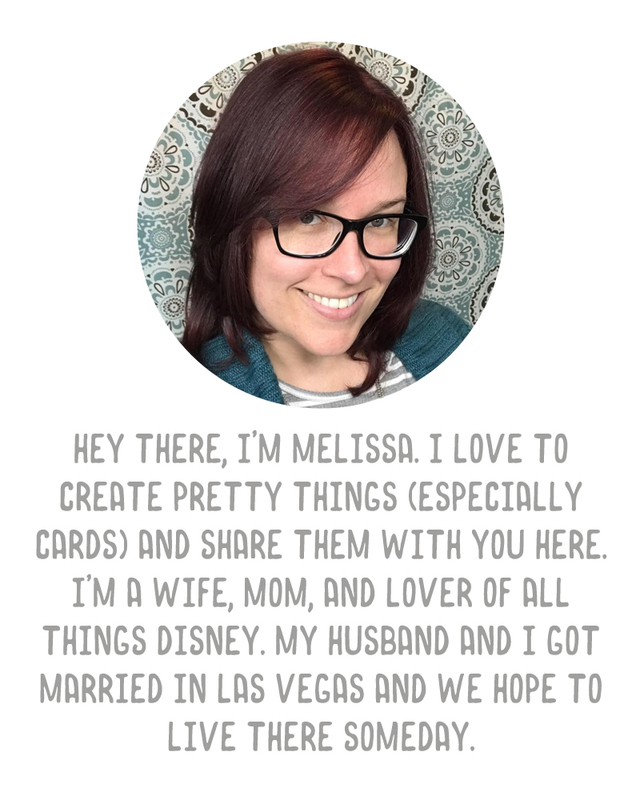 Hey there, I just started organizing my stamps earlier today after looking at your page. The process is going to take me a long time but this is such a clever idea! Once I get all of my stamps cataloged, it would be easy to keep it up whenever I purchase new stamps. I have some wood mounted stamps but I use mostly clear stamps and have been getting very frustrated trying to find stamps to complete cards. I would sometimes settle for whatever stamps I could find just to get the job done and never be totally satisfied with the final product. I know the stamp is in the pile somewhere, but getting to it is quite daunting. Now that I have started this system of cataloging my stamps, I can see how much more fun I am going to have and how much time I will save and be able to do more. I now have my clear stamps sorted according to brand in their original packets. When I look at the back of the inserts in my catalog folder, I can see which sections to look in for the stamps I need to complete a project. My next step is to include sheets of acetate next to each page protector with the actual clear stamps which correspond with the inserts. This will save me having to open and sort through stamp packets every time. 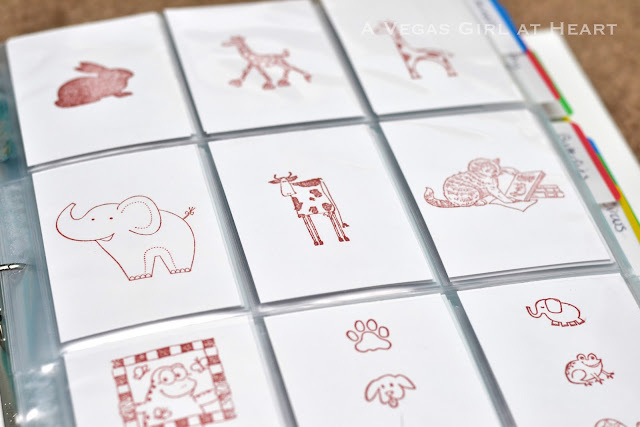 I will use sheets of white paper behind the stamps so that they will be more visible. I will keep the empty packets with the original acetate sheets showing the stamped images for easy reference of complete sets, whenever I need to get a visual of what goes together. I like to see complete stamps so to solve the problem with larger stamps which have to go into 6x4 pockets, I will purchase some multi-sized page protectors so that I can keep the images where I want them. Thanks so much for this wonderful idea as I have been searching for quite a long time and could never find anything that suited me. There were some great ideas on the internet, but yours suits my purposes much better. I found pages at the $ store that are normally used for coupons there are three pockets per page. Need to go back and get more, they work great! Have also been using the trading card sleeves. I have also put cutouts from my dies and punches in the book so if I know I want a heart, I can decide if I want a stamp, a die or a punch. I will soon have to start a second notebook but since my categories are alphabetized its not a problem.